Breakfast. We pushed Dolly to a fine little cafe in the shadow of the Beetham Church. The congregation were still in good voice and as such the cafe barren as we took our seats to breakfast. Coffee, cheese on toast with baked beens three times and for our Alfie a toasted bun and butter. The lady proprietor had been kind enough to send us our slightly late gaggle of four ladies to last nights show and we thanked her before pushing off. We waved goodbye to my wife and son before the longest haul so far. The road back into Milnthorpe was equally beautiful as the day before as we passed the fine grounds of sweeping country estate with a carpet of lush green grass mowed daily by the herds of sheep and deer before falling to a river we stopped for pictures. Once back in Milnthorpe itself we stopped at the local paper shop to collect The Observer and read our notices. The review of our Bardsea performance was printed and it seems the reporter enjoyed our show well enough with a particularly glowing report of marionette routine and our ambition to fulfil our quest to bring this humble show to the furthest nooks and crannies of Cumbria. I had hoped for a more in-depth description of our journey but the Observer is probably the most saught after publication for a review by any artists in our country and as such i was pleased they bothered to come so far from London to see us at all. We pushed along the road to Sizergh where we were to perform in the beer garden of the Strickland Arms. The roadside was perfect for pushing our Dolly. Not only did we have a pathway running alongside the main road it was also carpeted by freshly fallen blossom. This added comfort to our trudging steps and the intermittent rain barely bothered us. We took tea in the grounds of Levens Hall before we realised that our show tonight was at 5.00 pm and we were behind schedule with a further four miles to tramp on top of the four we had already shoved. 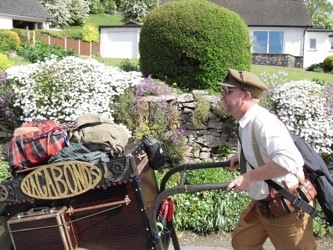 Picking up the pace we started past the roundabout leading back to the A590 and up the long steep hills to our venue. It was hard going. We took turns to shove and drag together and i had to press my shoulder into Dollys front as we descended down the first of three big hills. Towards the top of the last and tallest we smiled at each other as we realised the cyclist passing us was out of breath and that we would soon be tipping the edge and rolling quickly down to our waiting audience. Not half a mile from home Dolly collected her second puncture and we were pleased to mend it quickly. Arriving at the lovely pub we were given drinks and set up quickly to perform. Our largest crowd to date gathered around a eighty i would say and a vast collection of parents, grandparents and children enjoyed our show to the tune of £100.07 pence of hat. The sun shone just long enough to pack down and we set off to find the farmer who was to very kindly let us camp. Arriving we were shown to our pretty field and pitched the tents quickly as the rain started to fall. That done we trotted back to the Strickland Arms for a long leisurely dinner featuring mussels to start and baked cod for myself. Four pints of good beer later the kindly bar manager Ash informed us that the pub were to give us our meal and beer by way of thank you and replete we drifted back to the farm full and pleased with the deal. Many extra people had visited the pub this afternoon to see our show and our mutual benefit was agreed. Audience, landlord and showmen were well up on the day. As i lay back in my fresh tent typing this post card i can only imagine that Walter Wilkinson the inspiration for our journey will have laid back in his tent all those years ago with his pockets still full of coin reflecting on the kindness of another landlord, probably aching as we are from a long day of walking, pushing, hauling and performing. As i ready for bed my shoulders and legs are already starting to ache. I cant lay on my side as my pockets are full and the weather forecast is set to bring dry weather. Im comfortable and proud of our achievements so far and the honesty and integrity with which we push forward.